It’s October—Halloween month—a time when cemeteries get a bad rap. But as a historian and writer, I’d like to offer a view of cemeteries unmaligned. 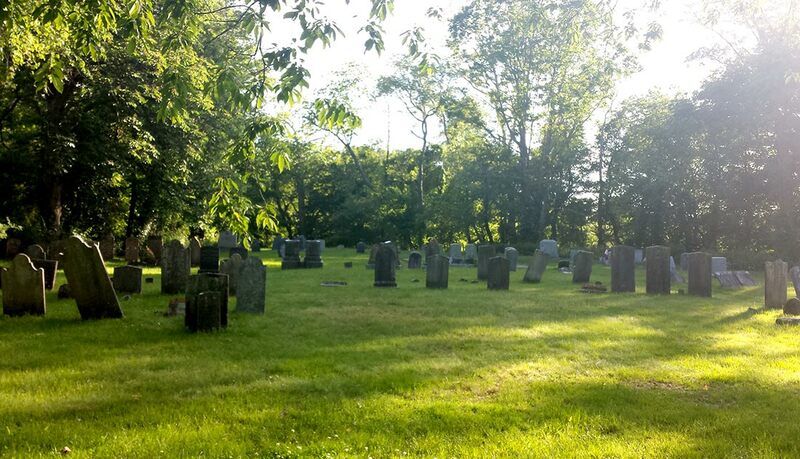 Not only are graveyards where our beloveds rest for eternity, but they’re also where you can find both your historical roots and fodder for your muse. I grew up in a tiny town in northwestern Wisconsin. Across the street from my high school was a cemetery. My teenage friends and I hung out among the dead. Not disrespectfully. We never sat on tombstones or scribbled graffiti. We’d stretch out on the grass, snack on Razzles and Pop Rocks and talk about boys. On the other side of the cemetery was the football field. If we were short on cash, we’d get into the games via the graveyard instead of the main gate, emerging behind the bleachers and saving ourselves about $2.00. If someone managed to pilfer a can of Pabst Blue Ribbon from her dad’s fridge, the tombstone of Mrs. Anderson, 1895-1965, provided cover while we all shared it. That was the life (pun intended). My high school cemetery was a hangout place, and I paid little attention to its permanent occupants. Now when I visit graveyards, those full-time residents are just the people I come to see. I’ll blog about some of the historic cemeteries I’ve visited in the future. Today’s post is personal. Finding your historical roots is the best way to get excited about the past. I have a feast and famine situation in the melting pot that makes up my family. My mom was born in 1927. She was adopted as an infant, and in the early 1990’s, Mom mounted a search for her birth parents. All she discovered was that she had been abandoned in St. Peter, Minnesota. Some teenagers heard a baby crying and found her in a basket in the backseat of a car. Newspapers lining the basket were from Chicago. Mom was less than a month old and was adopted within a couple weeks after being found. A DNA swab taken decades later revealed Mom’s ancestors hailed from northwest Europe. This was no surprise for a Midwest girl, but still frustratingly vague. Our family is left with a mystery unlikely to ever be solved. My dad’s family, on the other hand, has a well-documented history that stretches back almost to the Mayflower. Richard Dodge arrived in Massachusetts in 1638. He went on to have many children and they had many children, and here I am today. In 2012, my sister Liz and I headed east to dig up our Dodge roots. We knew Richard Dodge had settled it what is today Beverly, Massachusetts. Our first stop was the Beverly Historical Society. Liz and I spent several hours researching the Richard Dodge line and picking the brain of the museum director, Susan J. Goganian. We were lucky that day because local author Edward R. Brown dropped by the society office. From his book Pillars of Perseverance, I learned many details about the Dodge family, including how my great (9x’s) Grandma Sarah Dodge fought off officials who tried to seize her prized pewter platters for unpaid taxes. The highlight of our trip was a visit to Dodge Row Cemetery. This private plot of land was tricky to locate. Directions took us to a grand home and private driveway on Dodge Street. I’m sure we looked like we were casing the joint when the owner drove up. He got out of his BMW carrying a pizza box, aromas of pepperoni and sausage wafting out. Hoping he was a long-lost relative who intended to invite us to dinner, we told him we were looking for the Dodge Row Cemetery. Maybe our eyes lingered too long on the pizza because the guy clutched it to his chest and motioned us to continue down his driveway. I followed the road as it narrowed between hedge rows and trees. The sun was low in the sky as I rounded a bend. Diamond dust motes floated in an arch over a meadow dotted with tombstones. Stretched out before me was my family history. At this sight, my throat tightened and my eyes filled. Without looking at her, I sensed my sister was feeling the same intense emotion. Our dad, Larry Dodge, passed away in 2008. He prized his family history, but never visited the Dodge burial grounds. We got out of the car and meandered quietly among the dead. Then Liz help up the spice jar that held some of Dad’s ashes and I pulled a can of beer out of my purse. We toasted Dad, wept a little, laughed a lot, and left a bit of our father behind with his ancestors. The Dodge Row cemetery, like all graveyards, has a history to tell. Tombstone inscriptions give name, gender, age, military record, and family relationships. The shape of the stone and its markings can hint at religious beliefs of the dead. Other information must be inferred. Fresh flowers on an old grave tell me that someone alive still loves the person who is buried at my feet. Small headstones of children who lived but a few short months whisper that the mother who lies beside them carried grief with her to the grave. We Dodges are lucky. Not every family has its own cemetery. But your ancestors lie somewhere. Hunt them down. Find them. Sit with them for a while and discover your past. Not far from my rural Wisconsin home, St. Pat’s Cemetery sits atop a beautiful bluff. I often stretch out under the maple tree in the center of the cemetery and contemplate life. One day I spied a tombstone lying on its side among the woods that circle the burial grounds. I spit on my finger and rubbed the inscription clean until I could read it. Why does Sarah lie alone among the bushes and brambles? What could she have done to merit such isolation? What killed her at the young age of 13? History might answer these questions. I’ll hunt for documents in our local library and historical society. But if none exist, I’ve decided I’ll write Sarah’s history myself and find a way to give her a proper resting place through story. You see, when you hang out with the dead long enough, you want to bring them back to life.